An Array in R Programming is simply called as the multi-dimensional Data structure. In R Array, data is stored in matrices, row and columns, and we can access the matrix element using the matrix level, row index and column index. 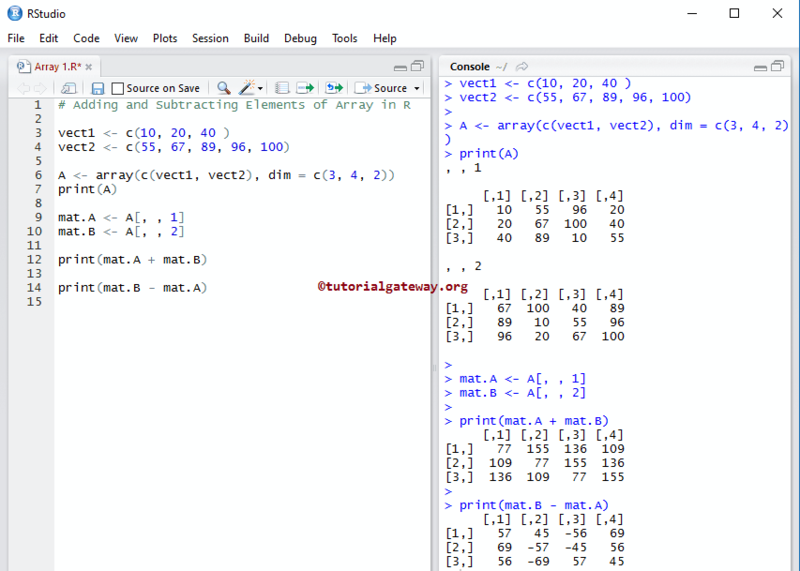 Matrices: It will decide the number of Matrices an array can accept. 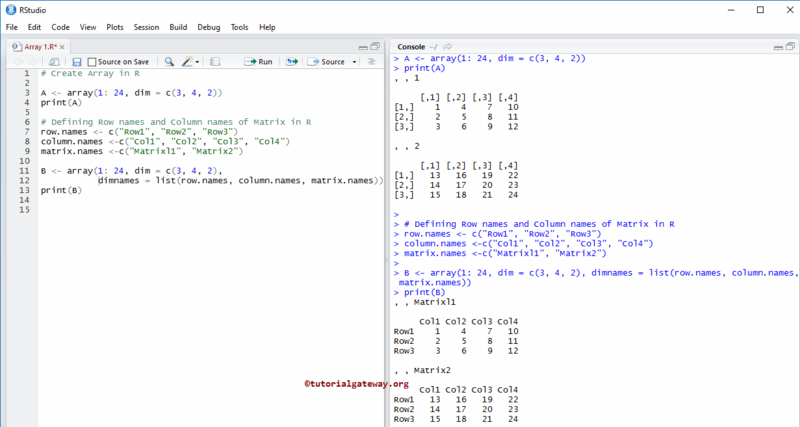 Array in R is always a Multi Dimensional, it means more than 1 matrix with rows and columns. Row_Size: Please specify the number of Row elements an array can store. For example, Row_Size =5 then each matrix in an array will have 5 rows. Column_Size: Number of Column elements an array can store. 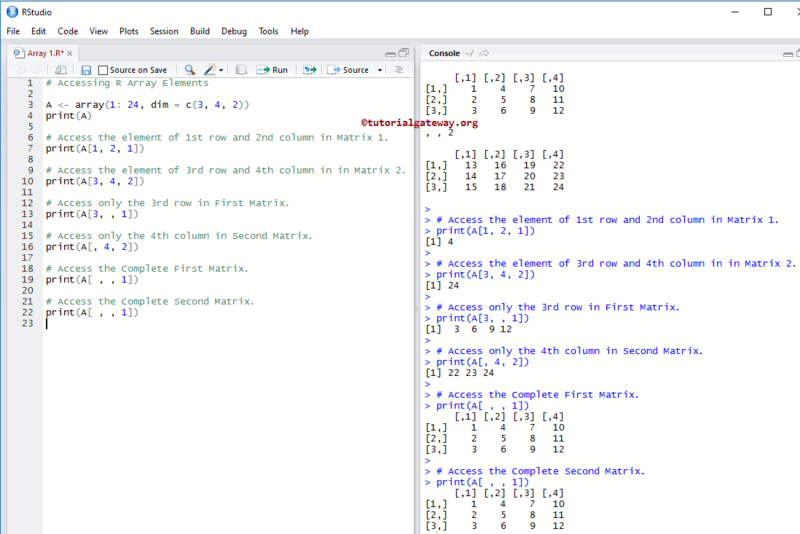 For example, Column_Size = 6 then each matrix in an array will have 6 Columns. dimnames: It is used to change the default Row, Column, Matrices names to more meaningful names. In this example, we will create an Array in R. Following code snippet will show you the most traditional way to create an Array in R Programming language. Below statement will create an Array of elements from 1 to 24 arranged in two matrices and each matrices contains three rows and four columns. From the above screenshot you can observe that, we are using c or concatenation function to combine those vectors to create an array of the elements are arranged in two matrices. Each matrix will contain three rows and three columns. In R programming, We can use the index position to access the array elements. 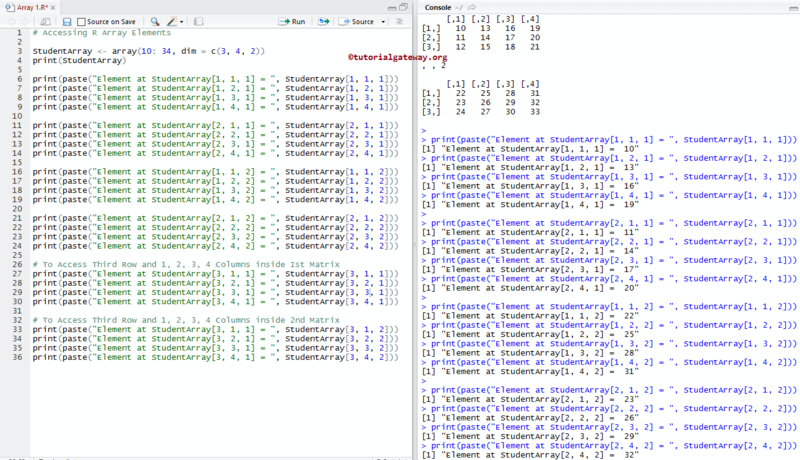 Using index we can access or alter/change each and every individual element present in an array. Index value starts at 1 and end at n where n is the size of a matrix, row or column. # Access the element of 1st row and 2nd column in Matrix 1. # Access the element of 3rd row and 4th column in in Matrix 2. # Access only the 3rd row in First Matrix. # Access only the 4th column in Second Matrix. # Access the Complete First Matrix. # Access the Complete Second Matrix. # Access the elements of 1st, 3rd row and 2nd, 4th column in Matrix 1. # Access All the element of 2nd and 3rd row in Matrix 2. # Access All the element of 1st and 4th Column in Matrix 1. 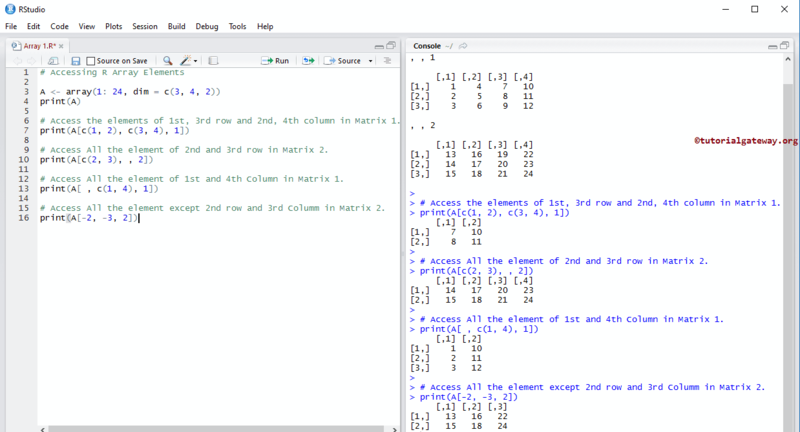 # Access All the element except 2nd row and 3rd Columm in Matrix 2. 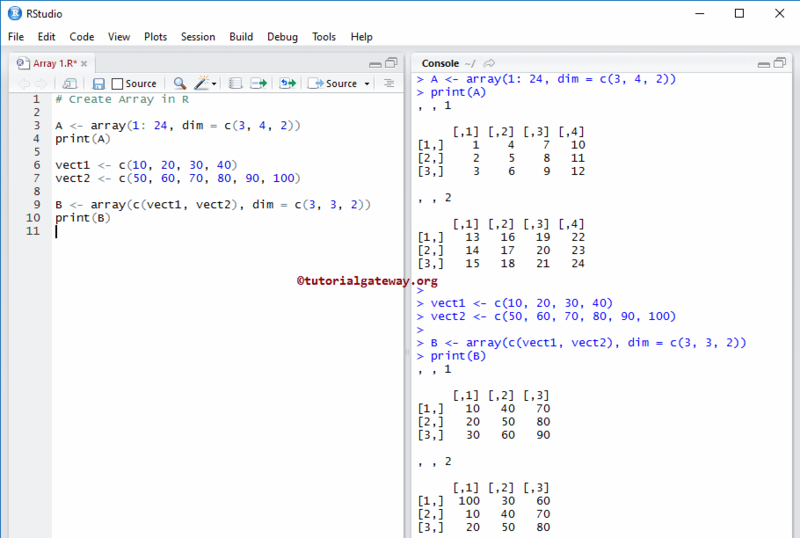 In this example we will show you, How to use R Arithmetic Operators on Matrices to perform arithmetic Operations on Array in R programming. To perform the arithmetic operations, we are converting the multidimensional matrix into one-dimensional matrix.